A Stunning Vocal and Instrumental Record, Abraham Brody & Wooden Elephant: "Red Sun"
Simply bewitching, reminiscent and entrancing. American-Lithuanian singer, multi-instrumentalist, and composer Abraham Brody shares the live video for "Red Sun" with Wooden Elephant ahead of their performance together at the London Jazz Festival at Village Underground on the 18th of November. 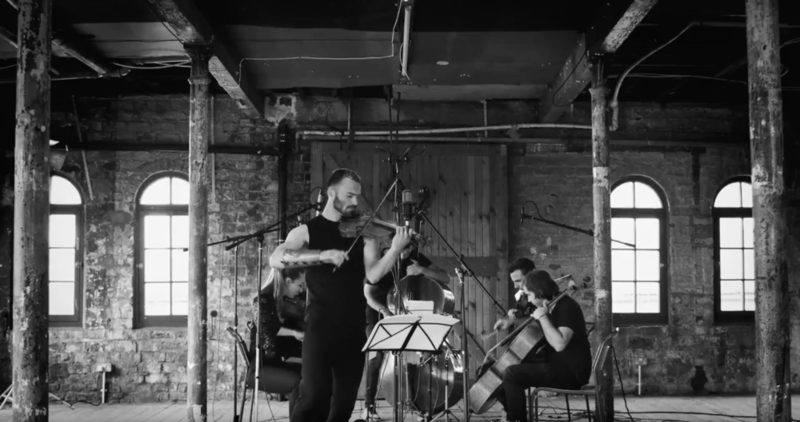 Shot by Tim Courtney at The Old Pipe Factory in Scotland this alluring black and white visual reels you into its moment and lyricism featuring Aoife Ní Bhriain on violin, Hulda Jónsdóttir on violin, Ian Anderson on viola and as composer, Stefan Hadjiev on cello and Nikolai Matthews on double bass. Live instruments are so essential and with the rise of technology most artists have abandoned their art but not Brody. Abraham Brody has performed on shows such as BBC Radio 3, NPR USA, Classic FM, Vernissage TV and Labas TV, and named ‘Top 10 Artist’ of 2017 by WNYC New York Public Radio. He hasn’t achieved such accolades by being ordinary in his musical stylings but indeed by bending the norms and contorting them into sounds that are immortal. Brody’s upcoming album, “Crossings”, his most compelling body of work yet is set for release on the 16th of November. “Red Sun” helps listeners peer into Brody’s soul and connectivity to the sonic arts. Check it out below.